The canary breeders in our club are all in full swing with paired up brids sitting on eggs or babies by now. I've heard that the people breeding lovebirds are also under way with breeding and hand feeding almost around the clock. Our Feb. 15th meeting was very informative. The attendees listened to a presentation on the importance of your birds' molt. There was some great discussion and tips shared after the presentation, as well. Thank you to all that attended. At this meeting, member Dan Pratt will be giving us a short presentation on building your own cages. Materials, paint, wire, etc., suitable for securing your birds in safety. I hope to see you all there. If you have any suggestions on topics you would like to see a presentation on, please let us know. Also, if you would like to give a short informative presentation at one of our meetings, please let me know. We all learn from each other! Our goal is to make our meetings as informative as possible to help you with the care, health, and enjoyment of your birds. Our club has voted to have a booth again at this year's Pet Expo held at Spruce Meadows. We feel this is a great event to educate the public about the great hobby of aviculture. We are asking that if anyone would like to help out in manning the booth for a few hours to a full day please let us know, as soon as possible, so we can coordinate. We always have beautiful birds on display at our club booth to showcase our club so, if you can help out with a bird or two to display for the whole weekend, we would appreciate it very much. If you do not have a display/show cage for your bird, the club may have a show cage to house your bird at the show for the weekend. This weekend is always a lot of fun interacting with the public to educate them on the hobby of aviculture. To offset the cost of our booth ($275) and electricity ($100) for this year's Expo we are offering a chance for our members that sell birds to showcase their aviary. Here's how it works, we're going to have a breeder's showcase section where we will display the business cards of members. If you'd like to have your business cards displayed, you can either pledge $20 or volunteer to man the booth for a few hours. We get a lot of people at the show each year asking about local breeders of all types of birds. The volunteers will hand our your business cards to the public asking for the particular bird or birds you breed. With the breeder's pledge, you would be responsible to supply us with your business cars (suggested 250-500) with the complete list of birds you breed on the card with your name, phone number, email address etc. Each year, a lot of our club breeders find buyers for their birds from the exposure of our club booth at Pet Expo. If you can help the club out with a pledge or volunteer a few hours, please let me know ASAP. We have begun planning for this year's Feather Fest. If you breed birds or have bird-related products to sell, please give some thought and help us out by renting a table at this year's Feather Fest. As with other activities the club holds, we need volunteers to help with set up, take down and everything in between. We hope to make this year's event bigger and better than ever. 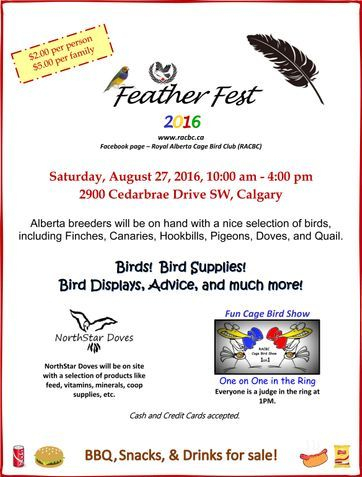 Our goal is to make Feather Fest the biggest and best show and sale of quality birds and bird-related products in western Canada. We are already getting inquiries about the date of this year's Feather Fest so we are expecting a great turn out form the public looking to purchase quality birds and bird-related products from reputable breeders. We are working on securing the same venue as last year to hold the fest in late August or early September. Stay tuned for more info. I would like to welcome all of the new members to our bird club. We look forward to meeting you and getting to hear about your birds. We encourage you to participate in our meetings and other events over the year to get the most fun from our club, as possible. The more you talk and interact with other members the more you learn about caring for birds as a hobby. Thank you for your time and we hope to see you at our next meeting or event. I hope you and your birds are keeping warm on this cold winter day. Our club is looking forward to a fun year with attracting new members, as well as, visiting with existing members to talk about the hobby we all enjoy that is caring for birds. Our first meeting of the year included a very informative presentation by Shawn. Shawn’s presentation was about how he prepares his canaries for breeding. All who attended came away with some new tips that we can apply to our own set ups in the future. There were some good questions by the attendees and Shawn did a great job with additional info on why his techniques are working well in the success of his breeding of high quality, healthy birds. There was also a great conversation after the presentation with other questions some of the members had about their own birds and their set ups. I hope the members that attended came away with some useful information. At this meeting we’ll be holding our club’s annual election of the executives which will be held in the first few minutes of the meeting. If you’re interested in voting for, or putting your name forward for a position (president, vice president, band secretary, treasurer), you must be present at the Feb 15 meeting by 6 pm sharp. Nominations are at 6 pm and voting from 6:15-6:25. Also, at this meeting, I’ll be giving a presentation on your birds’ annual molt and its importance to health and breeding. A reminder that 2018 membership dues of $20 for a single and $30 for a family were due on Dec. 31, 2017. If you haven’t renewed your membership, I ask that you do this ASAP as it helps us decide what our club can do financially for the entire year. We are currently discussing the club holding our first official bird show in the next year or so. To host an official bird show with accredited judges takes a fair commitment financially so your club dues go toward our club having the money to host such an official event. If you are thinking of ordering leg bands for your baby birds I remind you that your order, on our website, must be submitted to the band secretary no later than the 15th of each month. As usual, the club urges you to closed-band all of your babies. Banding is one part of promoting and ensuring the fair and ethical selling and buying of all birds. If you are not experienced in banding your babies, contact the club and we can have someone come to your house and give you a one on one demonstration on your babies. Most closed leg bands will have to be put on the baby bird’s leg in the first few days of the bird’s life so you should have the bands in your possession prior to the birds hatching. They grow fast!! Come on out to the February meeting. We would love to hear about your birds and how they are doing. If you have any concerns or questions about your pet bird(s) please come on out and get the answers to your bird troubles. The 2017 Pet Expo took place in April. It was a great couple of days. Pet Expo is an ideal place to showcase and educate the public about our hobby; let people know that aviculture is a fun and rewarding hobby; and, that our club is a great place to start. Our club will again be setting up a visit to the Hento exotic bird farm in Delburne, Alberta. The owners, Victor and Rhonda, have a wide variety of birds like geese, parrots, cranes, emus, exotic ducks, pheasants and chickens. If you enjoy exotic fowl, etc., then this will be a must to attend. The tour is free and, like last year, we will hold a potluck lunch on the grounds after the tour. The tour is guided by the owners and taking photos and asking questions is encouraged. We’re looking at the latter part of July and will let the members know the date a little later this spring. There will be a few of us going so you can arrange to carpool or drive up yourself. Stay tuned for more info. The 4th annual Feather Fest will be held on August 26 this year. We would love to make Feather Fest western Canada’s biggest bird show and sale with a wide variety of birds and bird products. Feather Fest has been growing in popularity every year and we look forward to this year’s event being bigger and better than last year. It’s becoming an anticipated annual event for many repeat customers looking for quality birds and bird products. Feather Fest draws more and more interested bird enthusiasts every year. As part of Feather Fest, we will bring back our One on One in the Ring bird show. This is a fun bird show where the spectators vote for their favourite bird in a one on one round-robin competition until the top three birds emerge as winners. We are looking forward to a great Feather Fest again this year, made successful and popular with your help and participation. Please consider renting a table. If we can top last year’s numbers for table rentals, we can look at moving the event to a larger, more easily-accessed community hall that will give us even better exposure. We encourage all members to help us in achieving this goal. I urge members to please help us in any way they can, as it is the volunteers that make an event like this a success. Our next club meeting will be held on Saturday, May 6, 2 pm - 4 pm at the Village Square Public Library, 2623 - 56 Street NE in Program Room 1. · sickness prevention for your birds. Pet Expo this year is being held the weekend of April 22 – 23, 2017, at Spruce Meadows Equi-Plex, 18011 Spruce Meadows Way SW. Our club is still looking for volunteers at our booth. If you can help us out with a few hours, a day, or both days, that would be great. As a volunteer you get a free entrance pass. Please let me know ASAP if you would like to help the club out. We can also use some extra help in the take down of our booth on Sunday, April 23rd from 5 pm to 6:30 pm. Also, our club usually gets some free passes for the Pet Expo to hand out to our members, friends and family. So, if you are planning to attend the show, please text or phone me at the number below on the morning of the day you plan to attend the show and, if we have any tickets left, we can meet you at the door with a free pass. Hello all. I hope you all had a great holiday season and a happy new year. The Royal Alberta Cage Bird Club is looking forward to another great year of learning, club events and informative meetings. We had an increase of members attending our meetings in 2016 and that made for more enjoyable bird discussions and learning for those who attended. We also had some new members join our club this year and we are looking forward to meeting them at some of the meetings or events and talking about their birds. Remember, the more you get involved in the club, the more you learn about your birds and the hobby of Ornithology. Our club had our first farm visit in July 2016. We were treated to an exotic bird collection like no other. The farm we visited was at Delburne, Alberta. Our hosts, Victor and his wife, Rhonda, have a private collection of birds from ducks and geese to peacocks, ostrich, cranes and parrots, just to name a few. Members brought a potluck lunch that we enjoyed on the beautiful grounds of the farm after the tour. We are definitely going to visit the farm again this year. If you are planning on attending the tour this year you will not be disappointed, I promise. We also held our 3rd annual Feather Fest in August of 2016 and it was a huge success. We had a great turn-out from the public and a lot of birds and bird related products were sold on that day. This is quickly becoming an event in Calgary that the public is looking forward to and the word is spreading. We are planning on making the 2017 Feather Fest even bigger and better. Stay tuned for the exact day in August this year. We are always looking for more vendors with birds and bird-related products. If you are thinking of renting a table ($20 for members) this year to get in on this wonderful day of birds and displays; bird products for sale; and, talking with bird people, now is the time to start planning what birds and products you might want to bring to Feather Fest 2017. Come on out to some of the next meetings and learn more about this year’s Feather Fest and how we can all make it a bigger and better show and sale. Thank you to those who have already paid. Remember that, for a $30 membership fee, we will add your aviary name, logo, and list of birds you raise, etc., to our club website under Membership-Local Aviary Listings. We do have people contact us quite regularly looking for quality birds. 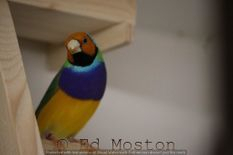 They find us under the Members Aviary Section of our website, so this is something to consider as another way to find great homes for your pet or breeding birds. Our club is holding the nominating and voting for the club executive at our first meeting of the year on Saturday, Feb. 4, 2017, at Southwood Public Library, 924 Southland Drive SW, 2:00 pm – 4:30 pm. If you would like to help in the organizing of club affairs and events, then I encourage you to come out and join the team. Thanks. I hope to see you at our first meeting of 2017. Come and join us at 2900 Cedarbrae Drive SW.
We will have everything from Canaries and Finches of all kinds to Doves, Quail, Show Pigeons, and even at least one breeder of rare and unusual colors of small parrots. A great group of people to learn from, buy a new pet, or just come and see all the amazing birds that are bred locally right here in Alberta. You might be surprised what you find at Feather Fest. Contact us if you are interested in renting a table at the event, or come out for the fun. Admission is just $2 per person or $5 for a family. There will also be a Show at 1:00pm. Everyone present will be encouraged to be a judge as the birds entered will have their cage numbers drawn to match them up for 1 on 1 in the ring matches. The crowd will vote on each matching and the victors will move on until the final winner is chosen. It is an awesome opportunity for participation and fun to be had as everyone gets their say for the "One on One in the Ring" show. If you are interested in getting a table, or have questions about the event email [email protected] and we will do our best to help. Don't miss it, See you there ! Hello, all fellow bird enthusiasts. The days are getting longer and the temperatures are rising. Spring can’t be far off now...can it? The migrating birds will start moving through the area in the next few weeks, as well. I have crocuses up in my yard and that is the earliest I have ever had them poke their heads up in the 30+ years that I have been gardening. If we can make it through the next month or so without seeing a freak blizzard or deep freeze temperatures, this winter will be the winter that never was (knock on wood). As most of you know our past President, Vedran Matkovic, made the tough decision to leave Canada and move back to Europe in October, 2015. I would like to take this opportunity to thank Vedran for his passion, long hours and tireless efforts in playing a key role in starting up the Royal Alberta Cage Bird Club. Vedran did a lot of behind the scenes work to lay the foundation that has made the club what it is today. I talked to Vedran a couple of weeks ago via Skype and he told me that he and his wife Mia have now settled just outside the southwest German city of Freiburg. It is a very beautiful part of the world and I wish Vedran and Mia the best of luck in their new journeys. Vedran told me to say hello to all the members and to tell you that he misses the club and its members very much. I hope everyone’s birds are doing well. A lot of breeders are maybe coming to the end of their 2016 breeding season or, in the case of canary breeders, the breeding season has just begun. In any case, whenever your breeding season is, I hope it was or will be successful. I have talked to a few of the club members about their breeding season so far this year and they’ve reported mixed levels of success. It always seems that no matter how well we care for and prepare our birds for breeding season, Mother Nature always has the last say as to whether we succeed, fail or something in between. I guess that’s what makes the hobby of Aviculture fun and interesting. Whether you breed birds or have them just as pets I would encourage all members to come to the next club meeting on May 7, 2016 @ 1:30 pm and share your stories and experiences with other members. It is a great way to learn. The more people that participate, the more fun the club can be for all its members. There is usually someone, with a similar story or experience, that may have a tip or trick that will help others in their quest for knowledge. Free snacks and drinks will be available. Club Executive elections were held at our Feb. 6 meeting. The team is excited about the coming year and the direction of the club. I would like to share a few things that the club has decided to participate in this spring. Our first participation this year will be in the 2016 Pet Expo being held at Spruce Meadows on April 23-24. Last year we had great interest in our display and, ultimately, the hobby of aviculture over the two-day event. We have decided that Pet Expo is a great place to showcase and educate the public about our hobby and inform or remind people that aviculture is a great hobby and our club is a great place to start. It seems that a lot of people are so busy nowadays that they forget or don’t know that the hobby of aviculture even exists and that it can be a relaxing and rewarding pastime. If any of our members would like to volunteer to help man our booth at the Pet Expo this year, please let me know. You can participate for a couple of hours, a single day, or both days if you’d like. It really is a lot of fun promoting our interest of cage birds with the attending public. Also, if you would like to show off any of your birds for the two-day show, please let us know. We have a great display of show cages for the birds and lighting to attract the show-goers to our booth. We always try to showcase as many different kinds of cage birds as we can for the public to see. Please feel free to stop by our booth at the show and say hello. Last year we had a lot of interest from the public as far as where they can purchase some of the beautiful birds on display. So, this year we will be printing leaflets to hand out at the Pet Expo. We’ll be selling advertising spots in the leaflets to advertise some of the breeders of our club. The price for an ad in our leaflet will be $25 for a quarter page, if you submit a readymade design; or $35 for a quarter page, if our person in charge of advertising designs one for you. With over 7000 people attending the two-day show, it is a great way to advertise the birds you have for sale year-round. The money from the paid leaflet ads will be used to offset the cost of the show booth. Our club is also thinking of setting up a visit to an exotic farm or two in the spring. 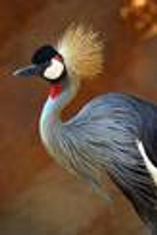 These farms have a wide variety of birds from swans to emus to exotic ducks, geese, pheasants and chickens. If you enjoy exotic fowl, etc., then this will be a must to attend. The tours are free and, with the approval of the owners, we may hold a free BBQ at the farms after the tours. These tours are usually guided by the owners and your photos and questions are encouraged. We will let the members know a little later this spring on a date and locations. We usually have a few vehicles going so you can either volunteer to drive or ride along to the farms. Club dues ($20 per year) are now due. These dues help us fund all the trips, events and functions for the year so please renew as soon as possible to help us keep the club growing. Dues can be mailed to 11119B Oakfield Drive SW, Calgary Alberta, T2W 3H3. It’s the members that make a club, so please help us grow the club for your enjoyment. If you have already paid your club dues, we thank you very much. A big thank you to Heidi (club Ring Secretary) for re-designing and launching our new website at www.racbc.ca. The site is still a work in progress but, for now, it is looking great. Heidi is asking that you send pictures of your feathered friends to her at [email protected] and she will put them in the Photo Gallery section. We have a new category on our website called Local Aviary Listings, which brings together people wishing to purchase birds and local breeders. Club members who wish to have their aviary listed on this page, at a cost of $10 per year, can submit their aviary info to Heidi at [email protected]. With our participation at events around Calgary (ie, Pet Expo, Feather Fest, etc.) and Edmonton (bird show and sale) over the year, we find that people looking for cage birds go to our website for info on local breeders. If you’re wishing to sell your excess birds, then the ad on our website is a great way to bring customers to your doorstep. I encourage you all to check it out. Another new feature, that will soon be available on our website, will be the ability to pay direct when you are ordering leg bands or renewing your club membership. This service will be available through Stripe tm, the safest and most reliable online payment method, to date. With this service, our members will find it a little easier and quicker when ordering leg bands or paying dues. I will send out a separate email in the next few days when we have this service up and running, including a quick “how to”.